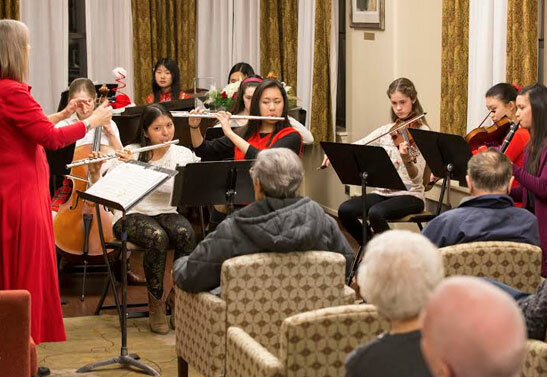 Student musicians from The Academy of the Holy Angels in Demarest did a lot to spread Christmas cheer in early December. 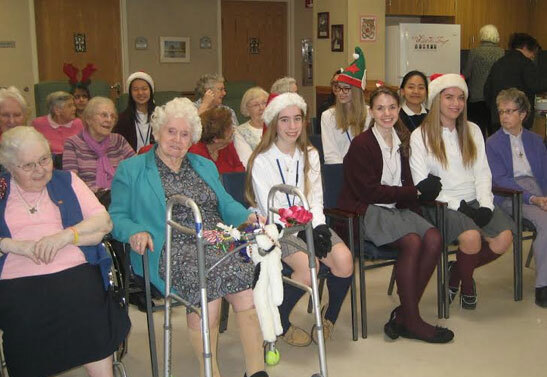 On Friday, December 5th members of the Tri-M Music Honor Society visited Villa Marie Claire in Saddle River to share the story of Christmas through traditional carols, songs and instrumental compositions. Villa Marie Claire is a residential hospice facility located in Saddle River, NJ. On December 6th members of AHA’s Vocal Ensemble, which had recently performed at Carnegie Hall in New York, braved cold and rainy weather at the Z100 Jingle Ball Store Hop at City Place in Edgewater, NJ. Led by Chorale Director Mrs. Lisa Marciano, the girls went into many stores and caroled to the delight of many customers. The event benefitted The Center For Food Action. Then on Monday, December 8, ten members of Tri-M Honor Society shared an afternoon of music with guests at the Family Promise Christmas Party in Ridgewood. Family Promise assists families with children who are temporarily homeless. Following their performance, the girls enjoyed creating some holiday crafts with the children. And on December 16th the Handbell Chior, directed by Mrs. Maryann Annecchino, visited the retired sisters of St. Joseph of Peace in Englewood Cliffs. The ringers performed a variety of Christmas favorites and the sisters joined them in song and even tried their hand at ringing the bells. All in all, it was a hectic schedule for the Angels who treasured their opportunities to reach out to the community through the gift of music.